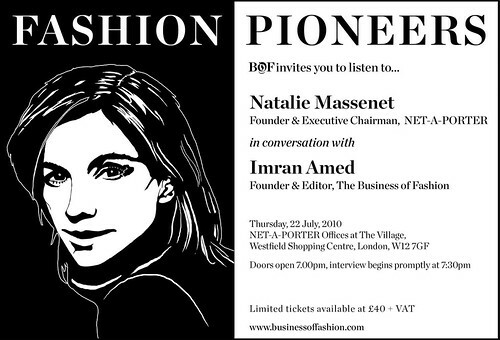 So I just watched Jefferson Hack's interview with Imran Amed of the Business of Fashion for the thousandth time, because it makes me very happy, and very optimistic about this digital age, which is so big that it's beyond any of us and we have no clue what to do with it, and about fashion in general. Don't you love this guy? I like how, among many other things, he said magazines are only more important now that there's no need for news and there can be substantial content. For me, there are only a few magazines whose more news-type stuff I read (Interview, T, Vogue US) and the others I really just look at the editorial content. Aaaaand I smiled at what he said about bloggers. Does this mean I think I deserve to be sitting front row, or at all, at a few shows? Hell no, and it's never because of my blog alone, it's because I'm affiliated with a project or magazine that has me there, but I'm happy to write about what I saw and how I feel about it on the blog as well, and hear what my commenters thought, and maybe this reaches a different demographic of people than a magazine or newspaper, because anything can only reach so many people before there have to be some that can't identify with it. This doesn't mean anyone has to be all print, or all blogs. No one is going to stop reading a magazine they like because they started reading a blog. Blogs are not magazines, they are not alternatives to magazines, and they usually have different goals than magazines, though it doesn't even make sense to generalize it that way because each blog or magazine has a different goal from the next. It just means that you can hear from someone with years in the industry and someone who is more outside of it; you can hear different opinions from people with different backgrounds, and this ultimately makes for a more interesting discussion. I don't think the digital age means that bloggers, not magazines or critics, decide what's cool or what people wear; I think it means that no one really decides that now, because there are so many points of views. I know that I don't try to give any advice about what people should wear, because I just would like everyone to wear what they want. This larger discussion sort of forces people to be more creative and honest, which is a good thing, no? All this Internet-ness makes fashion about a conversation anyone can take part in, which is, in my opinion, more democratic and interesting. Still, I didn't turn in my vote for the CFDA -- it's a different thing, because my opinion on my blog is less determining of someone else's fate than a CFDA vote. I can post a rap about Rei Kawakubo and write about the magic of Celine for this blog, but I can't hold that kind of responsibility for another person's career. I just want to be a part of the conversation. Very jealous of anyone who lives in London! For those of us who are stuck in our homes, it'll be livestreamed here on Thursday, July 22nd, 7:30 GMT. I can't wait! And now, while on my shopping fast, I am horribly tempted to look at Net a Porter. Ack.